I may have mentioned this before, but after we found out we were having twins and as we were getting used to the idea, I told Scott that it was important to me that we give them the chance to flourish independently. I hoped then, as I hope now, that they will grow up to be best of friends, but knowing who they are outside of each other is equally as important to me. 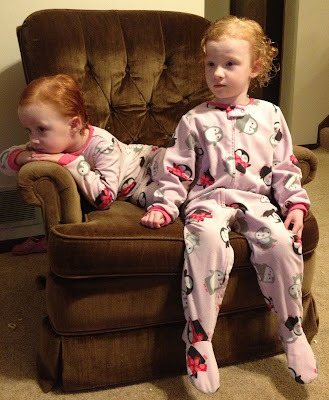 That's why, most of the time, I dress them differently -- it's a small way that I can say "Go be yourselves!" Not that they really struggle with that -- because, really, could they be any different? But I have to admit, it's fun to see them looking like "twins" every once in awhile. In case you're wondering... no, they aren't eating tubs full of butter. We save those because they make great popcorn buckets. 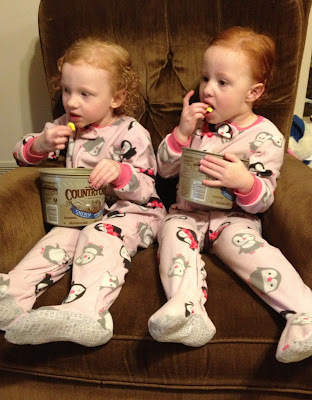 On second thought, I suppose they are eating tubs full of butter.